We are so very proud of our young nature conservationists around the world. They continue to inspire us with their dedication to the cause of conservation of endangered species and are an example to us all about how far passion and commitment can go. Here are just a few of our JUNIOR HEROES who are deserving of fair mention due to the incredible work they have done. 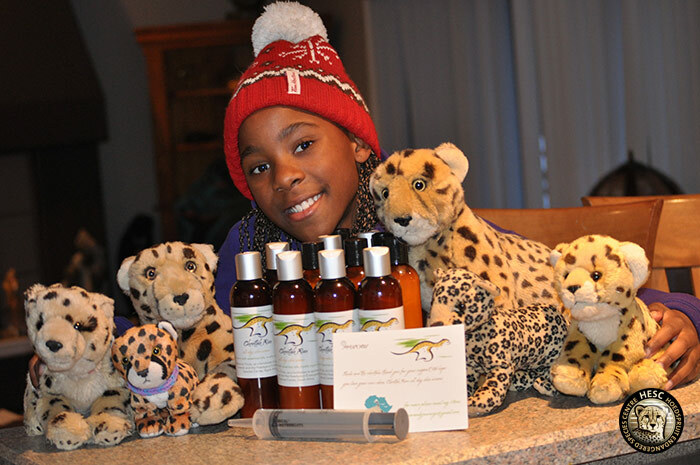 We want to thank Thula, an amazing young lady who made the organic all day skin cream called ‘Cheetah Run’ which helped her raise R5000.00 to be able to do a Junior Adoption of a cheetah and a wild dog fostering. It is amazing young people such as Thula that continue to inspire and amaze us with their passion for conservation. A big thank you to Lily Carey from St Peter’s College. This determined young lady, with the help of some school friends, coordinated a sale to raise funds for the Rescued Rhinos @ HESC. Lily and her friends managed to raise ZAR 285. Well done ladies! We are very proud of you. A big thank you to Imogen Biggs from the Kingsley School for Girls in England. This determined young lady, with the help of some school friends, coordinated a cake sale to raise funds for the Rescued Rhinos @ HESC. In anticipation to the fundraiser, Imogen set up posters around her school and showed a video about saving the rhinos to her peers. Imogen managed to raise a total of £120 (ZAR 1 935.60), and recently visited the centre to hand over her donation in person. Here she is with one of our staffers Sarina van der Merwe. We truly admire your resolve Imogen! It makes us really proud when, at an early age, the next generation understands the importance of conserving our wildlife and endangered species. A big THANK YOU to Rhino SA and Trinity House Preparatory Little Falls who raised R4,650 during their ‘rhino cupcake sale’ – they sold a whopping 2000 cupcakes! All the proceeds have been donated to the Rescued Rhinos @ HESC. 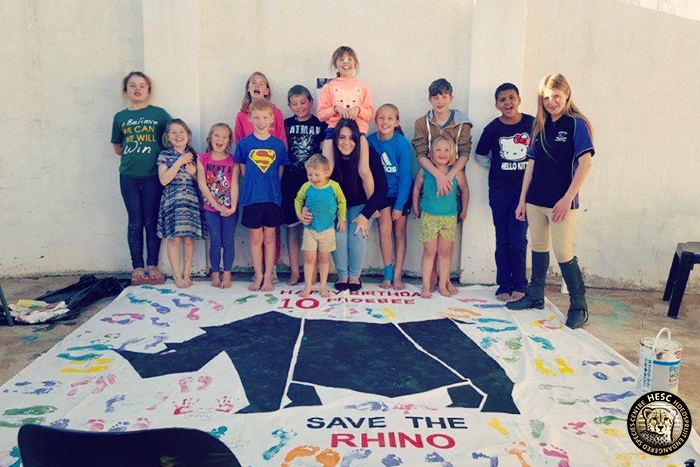 It’s always heartwarming to see little ones show great initiative and help raise funds for the Rescued Rhinos @ HESC. 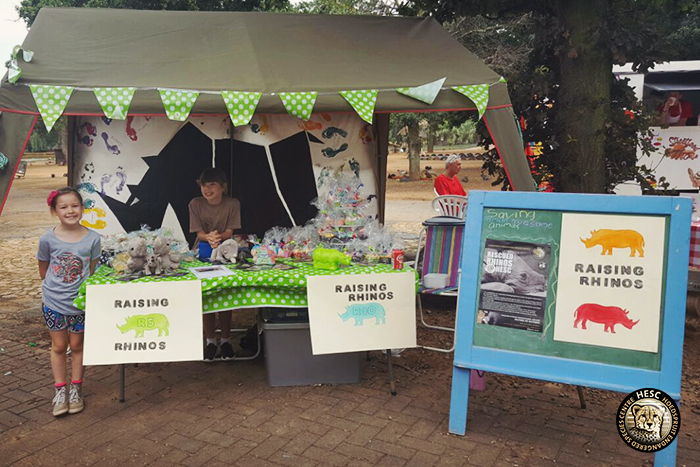 Young Phoebee, and her sister, Baylee, sold cupcakes and biscuits at the Bunny Park market to raise an impressive R1720. A big thank you to these amazing girls for their generous hearts. This wasn’t the first time that Phoebee has raised funds for our rhinos. She’s a true nature conservationist in the making! Phoebee Iris Roberts is our Junior Hero! 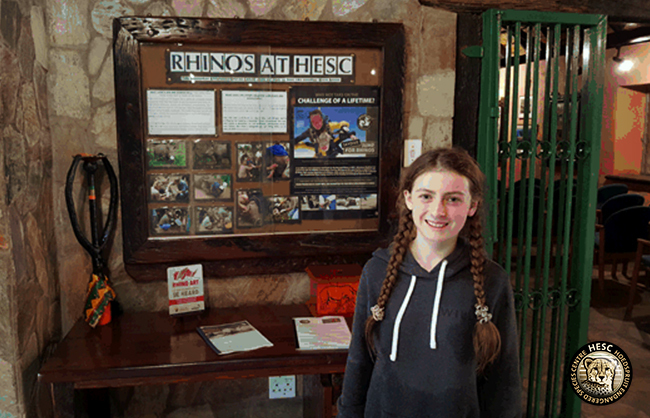 This young lady donated R1000 towards the Rescued Rhinos @ HESC. We are so impressed by this aspiring young nature conservationist, already making a difference. 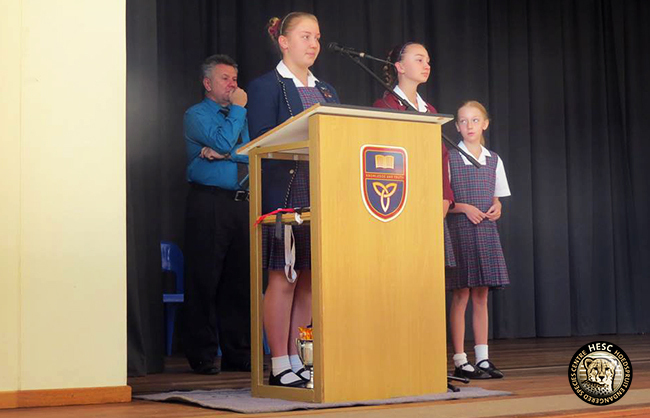 A 13 year old student at Scotch Oakburn College in Tasmania, Australia. Scotch Oakburn College is part of the Round Square Organisation which held their conference in South Africa in April this year. As part of their pre- conference tour they visited HESC and then presented HESC with the cheque. He was always interested in Cheetahs and know they are almost endangered in the wild, he wanted to help in any way he could. her school, King Henry VII. contribution to the conservation of our precious wildlife. A remarkable feat for a young girl of 7 years. Sacha Bray and her mom visited us at the Centre yesterday. 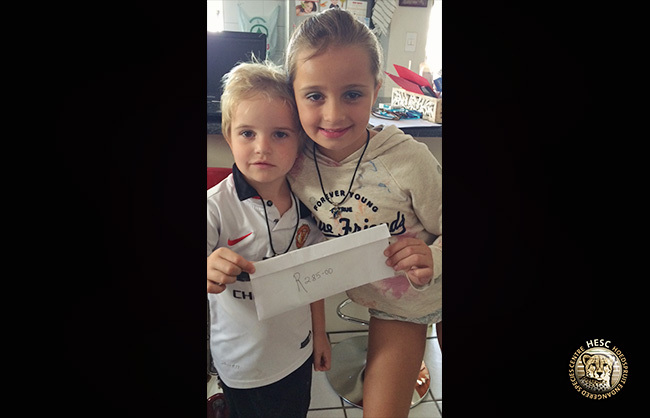 Sacha, seen here with Admin Manager, Anneli Lubbe decided to raise money for the rhinos by going around the neighborhood where she lives in GreyPark, Johannesburg. Thank you Sacha, your donation is appreciated and we need more people like you! Kate adopted the cheetah, Toffee. Click here to read the sweet letter she wrote to Mrs. Roode. Kit Smith is an extraordinary young man who is not only a budding author but also a committed conservationist. Following a recent trip to South Africa, he wrote a book and sold copies to fellow conservationists to raise funds towards the endangered and vulnerable animals of the HESC. Kit raised GBP 26.00, and sent a cheque to us as his way of helping out. Thank you Kit! You have impressed us, and humbled us immeasurably. We look forward to reading more of your books in the future! Click here to read Kit’s fascinating account. This amazing group of children single-handedly raised € 305,21 by making goods that they could sell to their community. They printed flyers for their cause and set up a stand to communicate what they were doing. They are all between the ages of 10 and 3! Their goal was to adopt a cheetah, but their hard work and dedication meant that they raised enough to adopt two! We are so proud of you all! Well done for your hard work and initiative…. Our young heroes at their stand, with the flyers that they made. Some of the goodies that the kids made to raise funds. ANRICH COETZEE, A STAR PUPIL! Anrich is a determined young man of 10 … He visited the HESC during the July school holidays earlier this year and decided that he wanted to adopt a cheetah. His grandmother pledged that she would donate R150.00 for every school subject in which he achieved over 85%. On Saturday the 8th November, Anrich realised his goal. He earned sterling results and has managed to now get his Junior Adoption certificate. He has also pledged that he will over the next few years raise enough to be able to fully and exclusively adopt a cheetah for a full year. We believe that he will do it! Anrich has decided that he wants to become a vet one day. We could imagine no better candidate for a job like this. John prepared a very detailed and informative presentation to his class on the cheetah, and how his fellow classmates could adopt one of these animals to help them. It is uplifting to see how John is lending a hand to spread the word on how endangered species need help.